We often like to think of politics as a spectrum or an abstract gauge on which one finds themselves: everyone is somewhere on the left, right or in the middle. In a way, it’s almost fitting that politics are depicted in fictional media as having their own spectrum — one not necessarily of political leaning, but of cynicism vs. optimism with reality somewhere off to the side. A common theme in politic-based media is conspiracies, because that attracts viewers. "It feeds into our fears," said Elise Banfield, a professor in the Department of Psychology. "When we can watch a show that highlights fears that we may not even be fully aware of ourselves, that show is going to sell — it's going to get an audience." However, it is important to understand the distinction between a TV show and real politics. Fictional Depictions Compared to "Real Politics"
While it is definitely a large part of what makes its political intrigue so engaging, “House of Cards” revels in its characters having nefarious goals and means. Within the show everything is a deliberate and usually selfish move for power, and there is rarely a character without at least one ulterior motive. The tonal contrast between "House of Cards" and the political show of the last decade, “The West Wing,” is stark to say the least. “The West Wing” gives an idealized portrayal of how politics should work, depicting a cast of altruistic public servants, always eventually solving the problem at hand — such a blatant romanticization that even Favreau understood why some might roll their eyes at it. While perhaps not realistic, those like Dan Pfeiffer, a former senior adviser to Obama, admit that to a certain degree such an interpretation was inspiring at the time. “If a generation of reporters signed up for journalism aspiring to be Robert Redford’s character in 'All the President’s Men,' then the Obama White House is staffed with younger aides (myself included) who entered politics hoping to serve a future President Bartlet,” articulated Pfeiffer in a 2015 article he wrote for Grantland. Both Favreau and Pfeiffer agreed that the show which actually captures the true essence of Washington politics is “Veep.” While the fictional universes of “House of Cards” and “The West Wing” may have constant drama or tension, Pfeiffer cites how the real thing is much less exciting. Like “Veep” depicts it, the act of running the government is apparently quite banal; only rarely will “moments of great excitement” happen. Pfeiffer noted how "Veep" captured how "absurdity is the new normal" in politics, words that ring that much more true now than when he wrote them in June of 2015 — four days before a certain individual declared his candidacy for President. 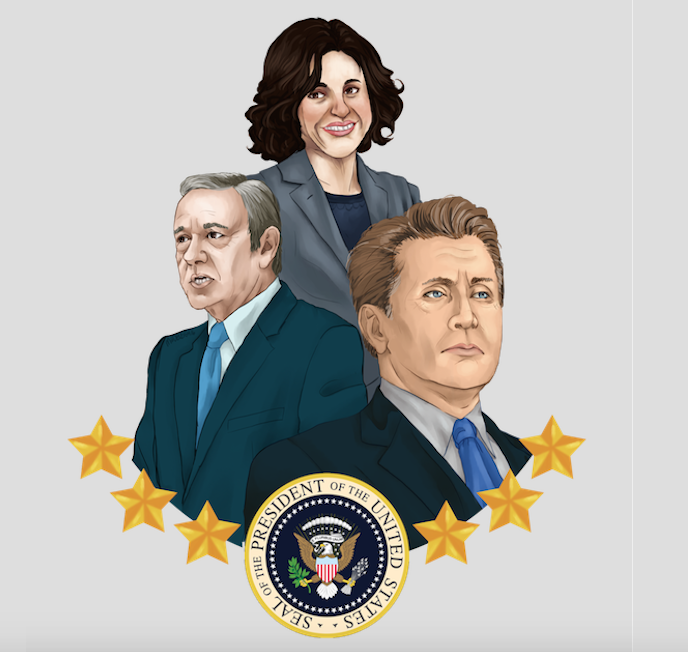 "['Veep'] started out as a political satire but it now feels like a sobering documentary." Despite being so far from reality, a show like "House of Cards" has the ability to engage its audience in a way which shapes individuals' perceptions of real politics. And unlike how Pfeiffer described "The West Wing" as something which inspired him, Banfield explained how a show like "House of Cards" gets its audience engrossed much differently. "I think people want to believe that. They want to believe [that's what's] actually happening," said Banfield. Banfield contended that the fiction which can conjure up a genuinely fearful message is far more potent in influencing its audience: "Anything that is going to trigger fear, is going to get people to bond more [with the material], because it gets them concerned. It speaks to their psyche and they worry." Negative emotions like fear and anxiety, according to Banfield, resonate far more than optimism or hopefulness. Negative emotions like fear and anxiety, according to Banfield, resonate far more than optimism or hopefulness. As for whether or not such impressions translate over to real-life politics, Banfield argued that despite viewers recognizing it consciously as a TV show, it feeds into our emotions on a subconscious level. "They'll accept on a conscious level that it is fictional, but then it gets them thinking about all these 'what if' scenarios," noted Banfield — pointing to how real-life political advertisements and other messaging will often suggest that what is currently happening, or about to happen, to be pretty dire. "Then we're not accurate anymore, we're living off of our perceptions. Our thoughts create our reality." Portraying such fears within the context of political fiction makes it all the easier to picture what form they could take as well. While "House of Cards" type conspiracies may not exist, Banfield noted how that won't stop people from looking: "For instance, for folks that don't support Hillary [Clinton], they may just be waiting for information to come out that would deem her in a negative light." Those that vehemently see politics through such conspiratorial light will disregard all evidence to the contrary, Banfield added. "Until they get that one nugget — that one nugget of knowledge and then they say 'there it is, see, I knew she was liar, I knew she was dishonest,' despite all this other evidence,” said Banfield. "[These conspiracies] may not be happening, but people will see what they want to see." Banfield pointed out that when there is a character with whom viewers can relate to on such a show, it further reinforces these perceptions. Fear is a powerful tool in getting people to bond with fiction.